Upper Grayston Block F, with Solid Green as the sustainable building consultant, has become the first building to achieve a 6 Star Green Star SA Office v1 As built Rating in Gauteng. The office block, situated just off Ann Cresent in the heart of Sandton, has been lauded as demonstrating ‘World Leadership’ in the South African sustainability sphere. Certified 6 Star on the Green Star SA rating system, Block E is an important first for Johannesburg, South Africa’s green building hub, and marks a major milestone as Solid Green’s first 6 Star As Built building. With the completion of this exciting project we hope that other developers follow suit as South African’s urban landscapes are transformed into sustainable, habitable environments. Developed by Brydens Commerial Property, Upper Grayston’s Block F was initially a speculative office development which is now fully tenanted a year after final completion. 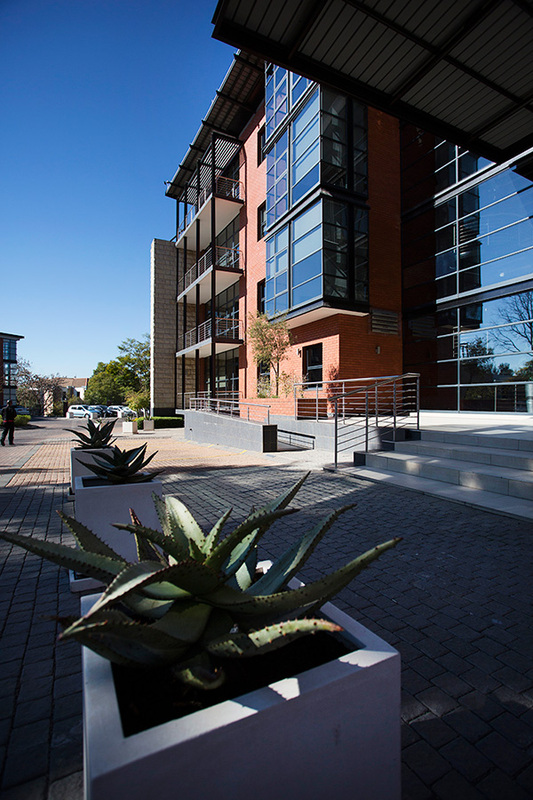 The building is situated at Upper Grayston Office park adjacent to Block E, which received a 5 Star – Green Star SA Office v1 As Built, which Solid Green also consulted for. The passive design features (orientation, shading, etc) have resulted in a good energy efficient building and efficient systems and renewable energy make the building even better. The building also implemented a number of Solid Green’s innovation initiatives, facilitating its achievement of the unprecedented rating. Find out more about what makes this breakthrough building super sustainable below. Upper Grayston Block F in Sandton, Johannesburg. to meet 15% of the building’s peak demand at its highest production. The system has no battery to store energy and works by first drawing energy from the panels before using the mains power connection to meet demand. Rainwater is captured from the roof, collected, filtered and treated to potable water standards and pumped into storage tanks on the roof (9m³/ 9kL in total). Harvested rainwater is used for all applications in the building, including toilets, shower and taps. Municipal supply water is only used when the rainwater has been depleted. Hot water, generated through a solar panel system, is continuously circulated to provide hot water relatively fast when opening the tap. Most green buildings have energy and water meters installed to monitor usage and indicate problems or leaks. Block F has gone one step further. By developing a simple way to connect users to their energy and water use so they have a means to control usage. Tenants could even compete and set targets, as well as use the data for reporting purposes. Block F then took it even further to automate the billing of each tenant, and to do so very accurately, so that tenants pay for what they use. Every member of the professional project team wrote and passed the exam by the Green Building Council and are now certified as Green Star SA Accredited professionals. Team members can now be the principal participant in the design team on all current and future projects, assisting the other project teams to integrate Green Star aims and processes. Upper Grayston block F makes provision for the platform to actively advocate Green buildings and sustainable mobility. This is done through hosting electric bike tours every Friday – in conjunction with Solid Green, Cycology and the GBCSA. The tour starts at Upper Grayston Block F and runs through-out Sandton to Green Star SA Rated buildings in the area. Providing educational tour with regards to Green buildings and first-hand experience on a sustainable transport mode. Address: 126 Ann Cresent, Strathavon, Sandton, Johannesburg, South Africa.